Among the flourishing organisations that made up community life in the past was the Royal Antediluvian Order of Buffaloes, which nationally was founded in 1822 and became one of the largest fraternal orders in the UK. 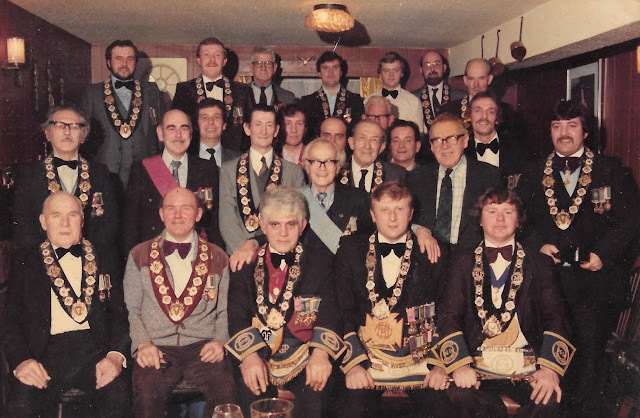 Silsden had a few lodges (branches) over the years and one survives, albeit with a handful of members. Their charitable purpose continues. This photograph is thought to have been taken at a local Lodge gathering in the 1960s to mark the initiation of Fred Benson. Back row (left to right) Sid Barnes, Laurence Driver, Tom Bancroft, David Wigglesworth, Jimmy Bardgett, Roy Moorhen, Henry Bentley. Middle row: Tommy Meegan, Jim Emmott, Colin Wainright, Dennis Chapman, Colin Waterhouse (to whom I am grateful for supplying the names), Arnold Mitchell, Sunyi Polyhos, Moses Ackroyd (in front of Jimmy Bardgett}, George Heaps, Basil Wasuta, Fred Benson, Richard Chapman, David Cooper. Front row: Bill Scaife, George Smith, Joe Meegan, Bill Welbourn, Gary Thornton.